Dave's Window and Gutter Cleaning has a rich history of satisfied customers. We have been in business for over 25 years, are a highly regarded company and provide quality work with excellent rates. At Dave's Window & Gutter Cleaning we pride ourselves on our work ethic and we provide unmatched customer service. In addition, we are fully insured and assure you that there is no job too big or too small for our professional team to handle. Arlington, Bedford, Bilerica, Burlington, Chelsea, Danvers, Everett, Lexington Andover, Lynnfield, Malden, Medford, Melrose, North Andover, North Reading, Peabody, Peabody Middleton, Reading, Saugus, Stoneham, Wakefield, Waltham, Wilmington, Winchester, Windham N.H. Area, Woburn. 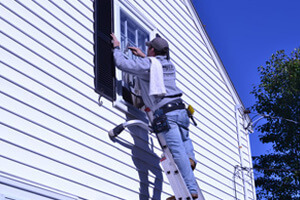 Dave's Window and Gutter Cleaning is dedicated to total customer satisfaction. We achieve this through providing quality window cleaning and gutter cleaning services from qualified staff at a competitive price. Our goal is to provide residences and businesses with the finest cleaning service possible.